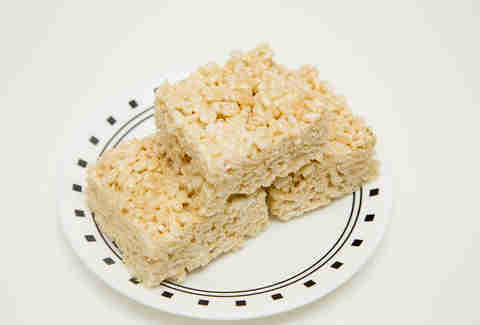 Who makes Rice Krispies treats? The best mom on the block, that’s who. As kids, we didn’t know they only had three ingredients and took less than an hour to make. 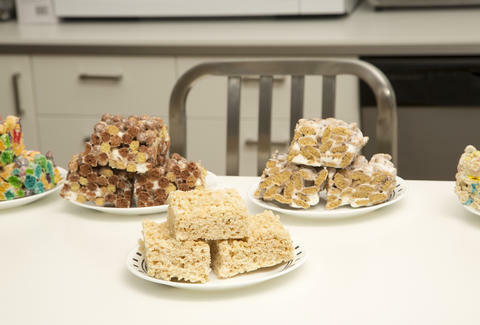 We were blissfully unaware that a big batch of Rice Krispies treats said “I love you, but not enough to make something from scratch”. So the question is, now that we’re adults with unlimited powers to make our own treats, should we venture on to other cereals, or stick with what we know to be great? Is there really a difference between 1-day-old pizza and 5-day-old pizza? 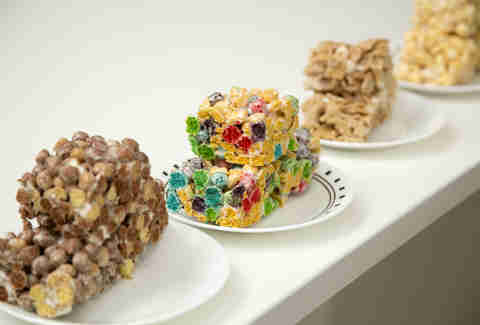 We tapped “Mister Krisp” -- a brilliant breakfast cereal sculptress who turns Rice Krispie treats into handbags, jam boxes, sneakers and more -- to make us 10 new-style variations on the classic. I’ve never had Churros cereal before so it’s hard to compare this treat to its original bowl form. So I’ll just compare it to the other treats: the sheer size of the individual churros makes the treat a bit clunky, and it’s hard to bite through them individually. Once you got past that, they tasted good -- very cinnamon-y. I remember Corn Pops fondly. They were surprisingly enjoyable considering they weren’t pressed into fun shapes and didn’t have some type of candy mixed in the box with them. In treat form, the Pops kept their chewy texture and (dare I say) were made chewier by the marshmallow addition. Yay Corn Pops. 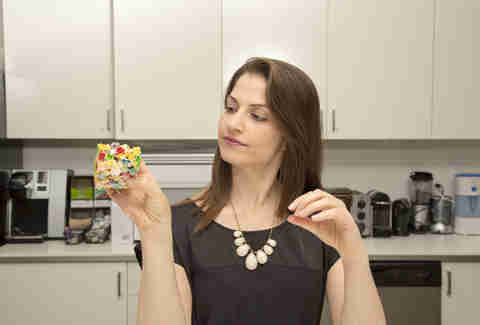 The Crunch Berry Treats are so fun to look at. They’re a party on a plate. I kind of want to play Tetris with them. They live up to their name. In treat form they were still the crunchiest, were pretty easy to bite through, and still as sweet and fruity as childhood. I always remember Reese’s Puffs being disappointing because they never lived up to the candy. Making them into treats didn’t really take them to any new heights either. They still taste like peanut butter (which is awesome), but still don’t quite achieve “cup”. Cinnamon Toast Crunch was hit and miss, less cinnamon-y than churros but easier to bite through. They softened a bit in the cooking process, which is good because I was afraid the jagged edges might scrape the roof of my mouth. They did not. Cookie Crisp turned into Cookie Not-So-Crisp when ‘treat’ed. 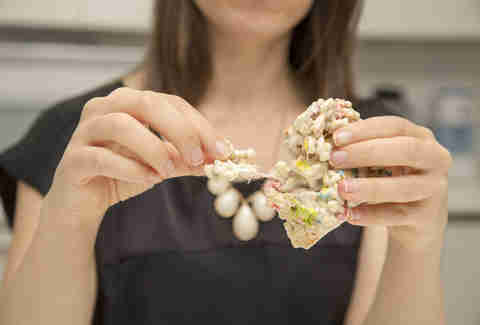 The marshmallow coating really got into the nooks & crannies of these treats. It almost had a life of its own, like in Ghostbusters but smaller. Lucky Charms were barely changed by this process. 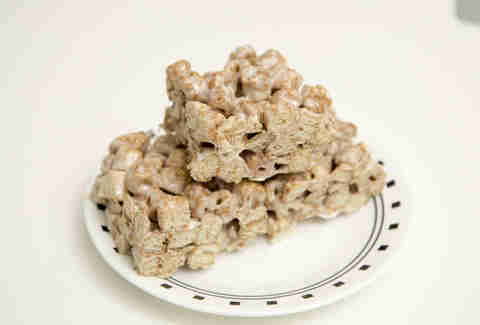 Yes, they all stuck together but because it was a marshmallow cereal now coated with another layer of marshmallows it tasted more straight-out-of-the-box than other, more transformed treats. The non- marshmallow part of the cereal (you know, the pieces we only ate when we got too lazy to pick them out of our breakfast) still had that warm wheat flavor. I always wondered why Life couldn’t have a different name. It's either too boring, or too metaphysical, or both. It doesn’t get much better as a treat. The shredded wheat texture is actually kind of nice, but the cereal is really just a vessel for the marshmallow and butter. Mikey might still like it though. I appreciate the use of Kashi Good Friends in this taste test for nothing more than the fiber, and that it makes me feel good to take lame healthy food and fatten it up -- like frying zucchini sticks. 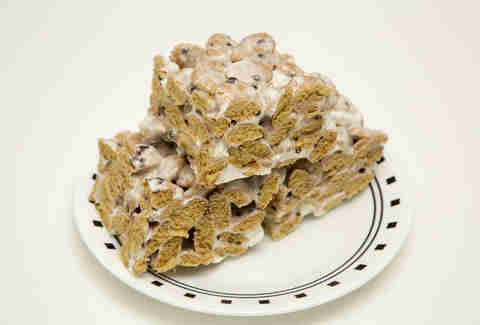 Unfortunately for this cereal, even with a good coating of marshmallow and butter, it still tastes like cardboard. Unlike zucchini sticks, I wouldn’t eat 20 of these and then rationalize to myself that I won’t gain any weight because there’s health food underneath. Apple Jacks hit a sour note. They weren’t bad, but the extra sugar coating overpowered the cereal’s flavor. I can still taste a little of the frosting but marshmallow kills the Jacks’ uniqueness. But just one bite of an actual, homemade Rice Krispies Treat brought me home. After tasting everything else I can honestly say that Rice Krispies is the absolute perfect cereal to use for all your treat needs. As I chewed that first bite Tina Turner started singing ‘Simply the Best’ in my head. The cereal is the perfect size and texture for this recipe. 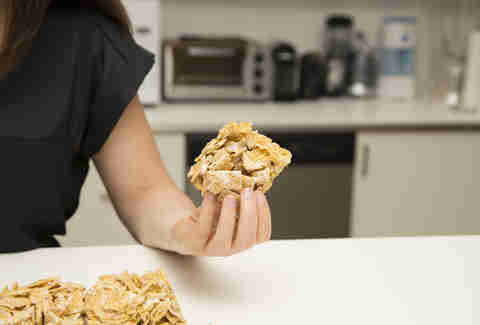 It makes the lightest, fluffiest, easiest to eat cereal bars. It is the standard for a reason. I want to thank the other cereals for participating in this experiment. The trip down memory lane was fun, but also reminded me that sometimes there’s nothing like the original. However if you want to turn Rice Krispie Treats into sports cars or bags of Cheetos you totally should. Mara Montalbano spent nine years as a crime reporter on Staten Island, but she never saw a more heinous act than Good Friends turned into a dessert. Follow her here.